What is the best gimbal head? What is the best panorama head? The Really Right Stuff PG-02 Pano-Gimbal Head is arguably the answer to both of these questions. The Really Right Stuff PG-02 Pano-Gimbal Head has been on my to-evaluate list for a long time and I finally made time to check this one off of the list. Let's dive right into the review, starting with build quality. A build quality discussion is not generally how I start a review, so why start the PG-02 review with one? I need to get a distraction out of the way. Raving about the exceptional design and build quality of Really Right Stuff products seems unavoidable and that is especially the case with this one. I'm sure the slick design has already caught your eye, so I'll quickly describe how the impressive PG-02 is work of art and then we can move on to the functionality discussion with a (slightly) freed mind. Solid is a good word choice for this discussion. The PG-02 is comprised almost entirely of machined aluminum and stainless steel parts, which, in addition to being very strong, are enduring. The strength of the parts seems better-than-military-grade and there is no unintended flex or movement between components. To gauge the precision of this head's construction, I slid a Mitutoyo calipers over the entire dovetail rail of the horizontal base. The thousands place digit on the calipers did not change. As might be expected at this point, all components fit precisely together. Fit and finish is impeccable. The smoothness of the pan and tilt movements, aided by high-grade bearings, meets the "like a hot knife through butter" phrase definition. You can set your expectations very high in this regard. Lock-down happens smoothly and movements are solidly held in place when locked. The captive large overmolded knobs are easy to turn and they roll smoothly in the fingers. This head is maintenance free with any parts needing lubrication being sealed. Exceptional is the strongest quality-descriptive word coming to mind at this moment and it is certainly not overstating the build quality of this head (wipe the drool) and equally impressive is Really Right Stuff's customer service, should you ever need it. With that discussion out of the way, let's talk about the pano-gimbal part of the model name. What is a gimbal head and why should I use one? To begin to answer this question, let's get a definition of gimbal: "A gimbal is a pivoted support that allows the rotation of an object about a single axis." [Wikipedia] From a photography point of view, that object is a camera and lens combination and the head part of the subject indicates that the gimbal is made to be mounted on a support, most typically a tripod or monopod. Why use a gimbal head? Controlling a large lens mounted over a ball head or similar mount is difficult and risk-filled. Gravity is constantly trying to pull your top-heavy ball head-mounted camera and large lens setup to the ground while you fight to maintain control over the rig. "Ball flop" is a painful term derived from this experience going bad, typically involving a camera and lens inadvertently tipping over, impacting the tripod hard and often knocking the entire tripod over, resulting in everything crashing to the ground. To answer a question that might have popped into your head, yes, I have had this happen, but only once. I caught a 500mm f/4 lens and Canon 1-Series body with my foot just before they hit the ground. Trust me, you don't want that experience. It is psychologically (and likely financially) scaring. A properly adjusted gimbal mount places the weight of the balanced camera and lens at or below its pivot point with gravity not influencing the position of the rig. This setup leaves a heavy lens and camera body practically weightless to the photographer. Only two fingers are needed to orient even a pro body with a Canon EF 600mm f/4L IS II USM Lens mounted. Another benefit is that, if the head is properly leveled, the camera remains leveled regardless of where it is aimed and that is one less task to be concerned with. While gimbal mounts are practically requisite for large lenses, they work very well with smaller ones for the same reasons. Gimbal heads are a joy to use, especially when following an in-motion subject. What is a pano (panorama) head? A panorama image is the result of many sub-images, generally overlapping each other by some amount (by 1/3 of the frame is a good choice), stitched together using software. 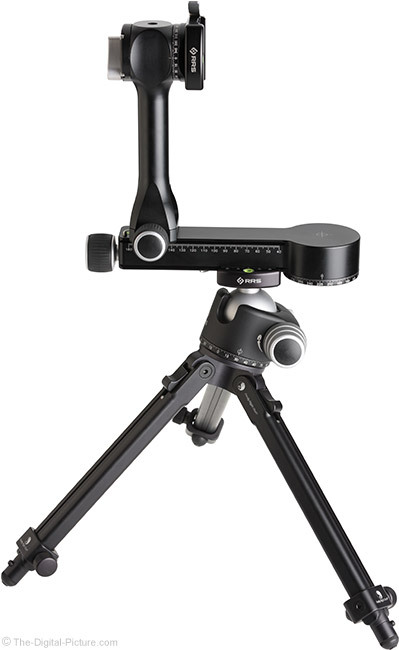 A panorama head is a tripod head that is especially well-suited for careful camera positioning aiding capture of the single or multiple rows of images needed for a panorama. 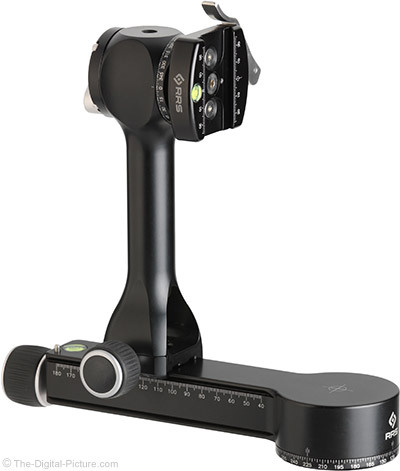 A single-row panorama head rotates the camera on a single axis and a multi-row panorama head provides two axis rotation. While a variety of standard heads and parts can be used in place of a proper panorama head, a built-for-the-job head makes life better and perhaps none are better than the PG-02. The RRS PG-02 is a modular head with all parts available individually or in logical packages. I will discuss those parts next, but understand that a camera or lens with a standard Arca-Swiss-style standard plate is needed to enable attachment to the PG-02. That is a good requirement as this standard is extremely useful. I highly recommend you base your kit on this standard and also recommend, specifically, an L-plate for cameras (vs. a base plate). 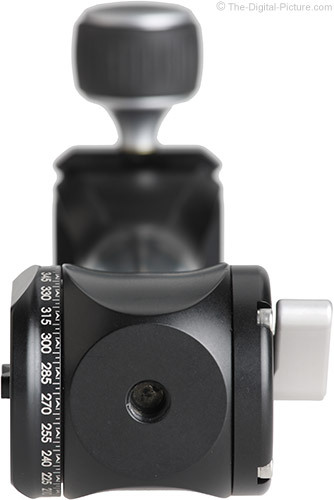 The foundation of the PG-02 Pano-Gimbal Head is the PG-02 HB Horizontal Panning Base. This is a very substantial, rather long piece that features a 360° panning base and dual dovetails consuming the balance of the length. The end-positioned pan lock knob turns a long stainless steel rod to engage the panning brake. Part of the specialness of this head is that the horizontal base allows adjustment of the vertical arm over a wide range of panning radius. The top of the base features a 12mm bullseye level (an important feature) and a spring-loaded slide stop pin to prevent an attached accessory from inadvertently sliding off. The substantial stainless steel tripod mount is threaded to the 3/8"-16 standard. The panning drum brake is tightened significantly to install and uninstall the base on/from a tripod, monopod or other support. 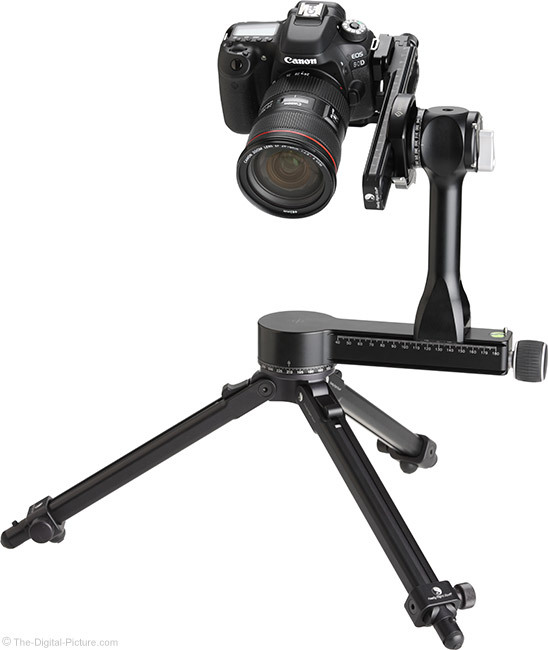 Once leveled, the horizontal base alone can be used with an RRS FAS clamp for single-row panorama capture. The PG-02 VA Vertical Arm mounts to the horizontal panning base's dovetail to complete the primary structure for the PG-02 head. The vertical arm can slide over the end of the rail top, or its clamp can be opened up wider and directly placed into position over the dovetail (I find the latter method easier). Simply open the large lateral slide lock knob, align the arm as desired and lock the knob tightly. And, it definitely locks tightly. 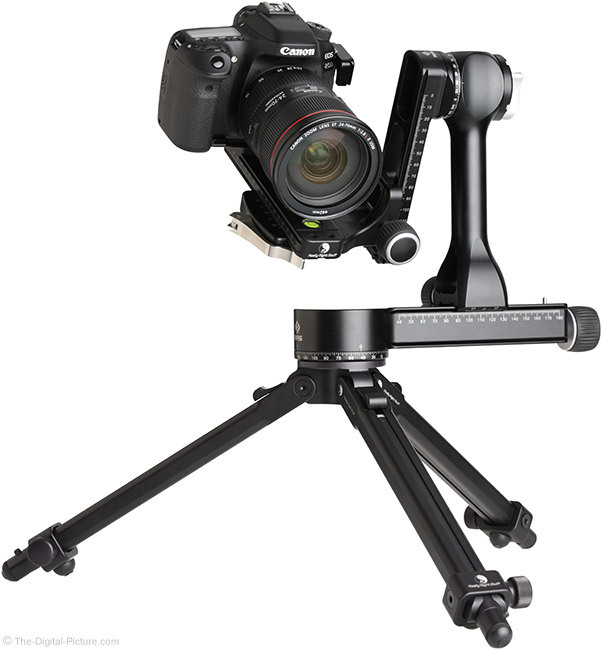 Though not the conventional setup, the vertical arm can easily be attached to the bottom of the horizontal base, providing a lower camera position. Of course, clearing the tripod legs could be an issue. Like the base, the vertical arm is a substantial part. It is hollow (a weight saving design quality), but there is very adequate wall thickness for utmost rigidity. Start connecting parts at 90° angles and flex becomes my immediate concern. Fortunately, that concern was unfounded – this connection is rock solid. Near the top of the vertical arm is the 360° tilt rotator with a mount (including anti-twist nubs) for a clamp or rail and a corresponding lock lever positioned on the opposite side. Note that older PG-02 models featured a very large lock knob in place of the new compact lever and I was concerned that the relatively small lever would prove inadequate. That was just another unfounded concern – the lever works great. Any desired drag amount can be easily adjusted to, ranging from free movement to totally locked into place and I am not strong enough to rotate the clamp with the lever only moderately tightened. A 3/8"-16 threaded insert is provided on top of vertical arm for ... anything you want to mount there and the options are practically endless, including a ball head or a microphone. As you will see in pics later in the review, I used a threaded stud to mount an RRS BH-30 Ball Head directly on top. Having a ball head available allows another camera to be mounted, perhaps capturing video while the primary camera is capturing stills or perhaps simply making another setup immediately available. The BH-30 has about the widest base that will comfortably mount inside of the rotator. Note that older PG-02 models have additional smaller threaded inserts – these are no longer part of the design. I admit to being a little surprised that the vertical arm is not dovetailed as this feature would add versatility. Dovetails on the vertical arm would potentially allow it to be mounted directly to a ball head clamp that is set to a 90° angle in a drop notch, potentially forgoing the need for the horizontal base in certain situations (with lighter weight gear). In addition, various other accessories could be clamped to the arm. That said, the rounded vertical arm makes a comfortable carrying and positioning handle and dovetails would detract from that comfort. Dovetails would also require a size increase over the vertical arm's 1.125" (28.5mm) diameter as dovetails are 1.495" (38mm) wide. While the PG-02 is available without a clamp, most will want a clamp and RRS clamps are among the best available. Learn more about these in the RRS Lever Release Clamp Review. Note that, while I love RRSs lever release clamps, I do find thumbscrew-style clamps slightly easier to make the slight gimbal balancing adjustments with, especially when using a side-mounted clamp. The PG-02 Vertical Arm will accept all full-size current model 3/8"-16 threaded RRS clamps with the anti-twist nub relief groove on the bottom. 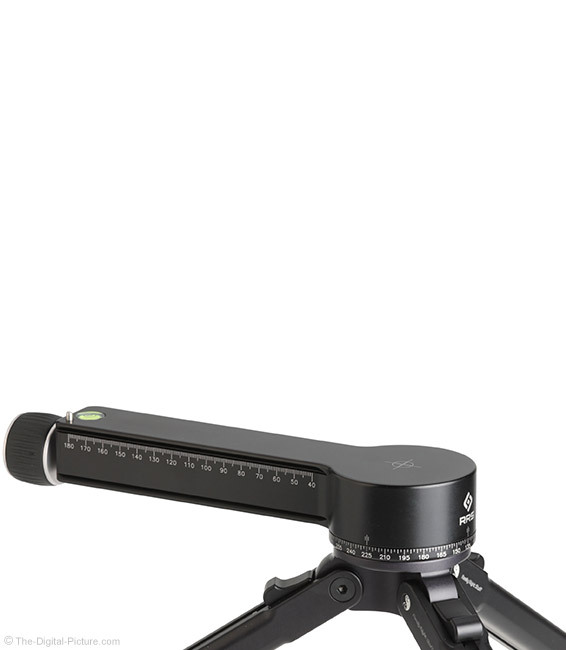 Clamps directly attached to the vertical arm create the ideal 360° panorama head and create a side-mount gimbal setup ideal for use with even the largest collared lenses. 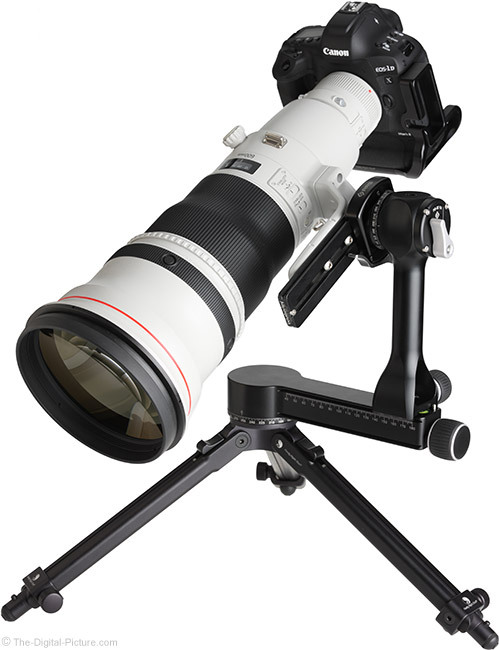 Note that a vertical arm must be horizontally adjustable on the base to center any side-mounted cameras or lenses using a side mount and, as already discussed, the RRS PG-02 has that feature. The first packaged clamp option is the B2-LR-II Lever Release Clamp with 60mm jaws. Most will find this to be the perfect option. Similar to the first option is the B2-LLR-II Lever Release Clamp, offering the same features as the B2-LR-II with the extra "L" in the name referring to longer 80mm clamp jaws. This option costs and weighs slightly more than the smaller clamp, but the differences are minor. We use B2-LLR-II clamps on some of our large studio/lab heads, but I didn't feel the need to mount one on the PG-02. 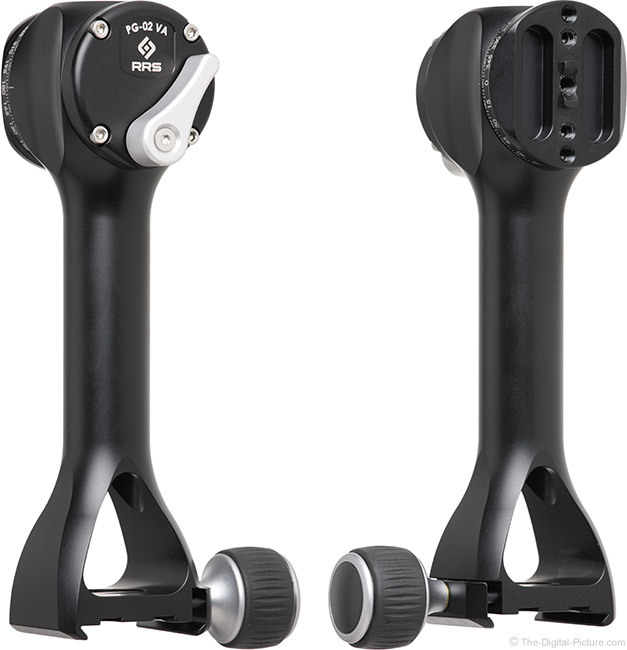 The PG-02 "FG" option refers to Full-Gimbal with Cradle Clamp version that includes the PG-VR Vertical Rail and the PG-CC Cradle Clamp in the package. The rail attaches to the vertical arm identically to the clamps and provides a significant dovetail surface with safety stops at the bottom. The substantial cradle mounts to the rail, providing a large top-loading lever release clamp at a 90° angle from the rail. The clamp is adjusted on the vertical rail to center the lens on the tilt axis. 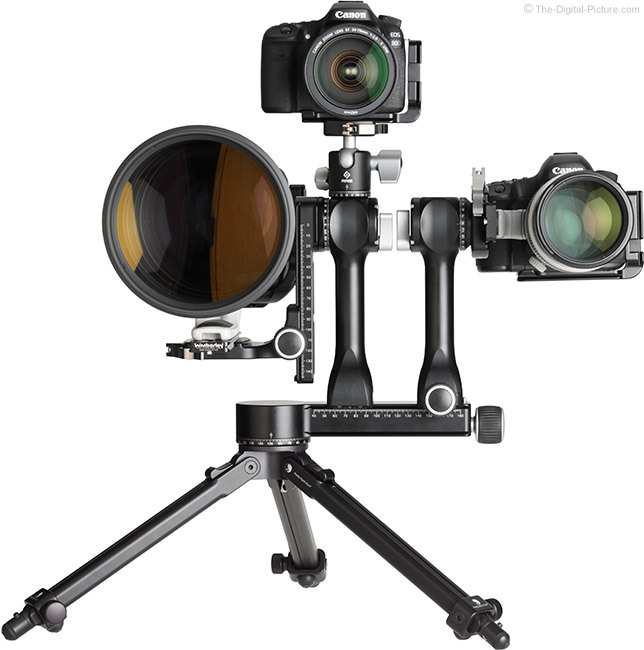 Should I get the full gimbal with the cradle clamp or the side mount clamp? All of the PG-02 parts are available individually, but the packaged versions are less expensive overall and with that in mind, I went into this comparison with a strong bias and I set out to justify that decision. I have long used a full gimbal mount and wanted to make the RRS PG-02 full gimbal version a part of my kit. I already had an RRS clamp that would make switching between the two options easy. First, let's answer a common question. Is the side mount adequate for using a large telephoto lens? Absolutely. 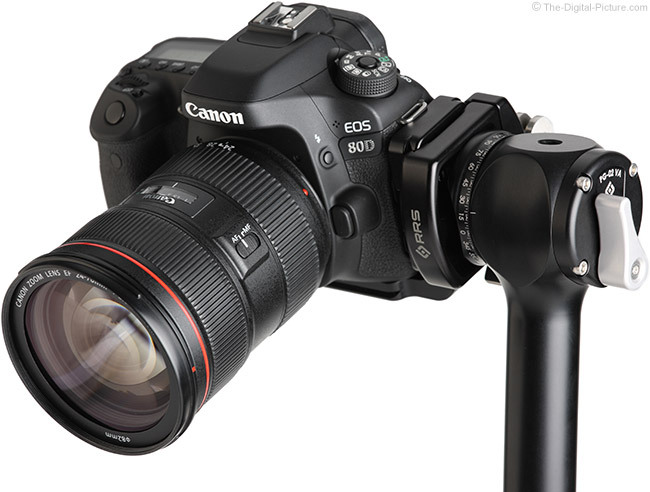 The 600 f/4L IS II on a 1D X Mark II is shown side-mounted below and it moves beautifully smoothly with no strain detected. It is of course far under the 50 lbs (23kg) PG-02 load capacity rating. Another question we should address is: are the movements different between the two options? No. 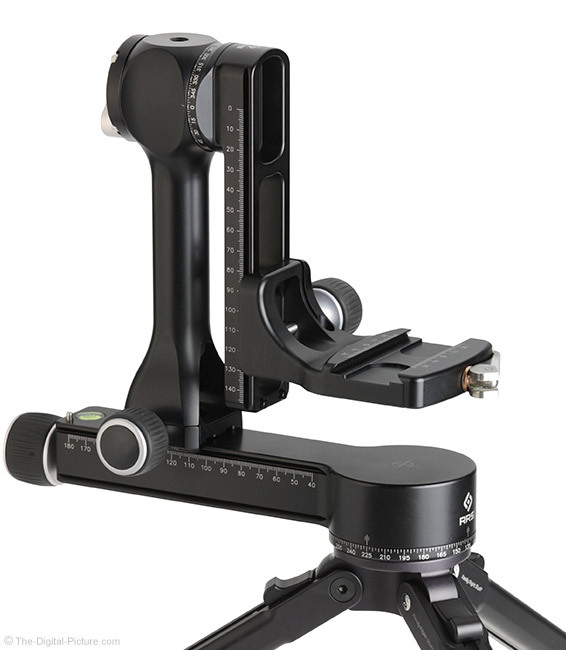 If both setups are properly adjusted, the balanced and centered lens pivots precisely on the panning and tilt axis and the movements are identical. There may be a psychological difference, but not a real one. Get over it (words of advice to myself). What are the advantages of side mount gimbal head? Touching on the first side-mount advantage in that list, with more parts between the tripod and the lens, the cradle adds slight additional vibration dampening time. The difference was roughly 7 seconds vs. 5 in my evaluation with a 600 f/4 on a pro body (note that some of both times is attributed to the lens and its tripod mount). The vibration difference will not be of significance with moving subjects, but it could be a factor with more-stationary subjects (perhaps the moon?) and in the wind. OK, so what are the advantages of a full gimbal mount? I was off to a slow start on this list, so I decided to get the assistance of a Really Right Stuff representative. Surely the trained rep could help my quest to justify the full gimbal setup. What was their immediate answer to that question? "None." We chatted a bit, but I didn't get anywhere. He told me to get the 60mm clamp version. Fortunately, I came up with enough reasons on my own to at least create a list. It looks cooler with all of those extra parts. The cradle is easier to load with gravity aiding the process. Given the expense of what you might be loading on this head, don't take this advantage too lightly. Large lens rain coats are often designed for a bottom-mounted lens. For some large lenses, the cradle positions the vertical arm closer to the panning axis than with side-mounting, making it slightly more comfortable to use with an arm over the top of a big lens for stabilization. The difference for the Canon 600 f/4L IS II Lens is 35mm, with the 160mm setting used for the side mount and 125mm for the cradle. However, the opposite can also be true. A short-footed tripod ring on a small-diameter lens may place the vertical arm closer to the panning axis when side-mounted. Side mounting the camera (without a collared lens) requires an L-bracket for portrait orientation and minimally a base plate for vertical compositions, which results in the lock lever being positioned to the right of the camera. Cradle-mounting a camera body requires an MPR-CL II (nodal plate, perpendicular plate or similar) along with, minimally, a base plate for horizontal composition and an L-plate for vertical composition. That was a lot of words to say that the side-mount has an advantage for direct camera mounting, but it isn't a big one. When I started this review, I expected to advise buying the cradle version and picking up a clamp to have the benefits of both systems (the swap is easy to make), but in the end, I couldn't justify having the full gimbal parts wasting space in my kit. I bought the PG-02 with the B2-LR-II Lever Release Clamp (60mm jaws). Use the money you have left over to buy the MPR-CL II. While the PG-02 is super smooth and great for video use, RRS has an even better option for that purpose. Take the same great qualities of the PG-02 and add 4 levels (3 damped plus off) of fluid-damped panning and tilting for an even better video capture experience. While the FG-02 continues to support 50 lbs (23kg), the damped load capacity is reduced to 15 lbs (6.8kg), which is still a significant weight. The FG-02 is slightly heavier, but the primary downside is that the FG-02 costs considerably more (they are a build to order product for RRS). Laser-engraved scales and index marks are found on all parts of the PG-02, allowing for precise centering and adjustment and facilitating repeatable positioning. The horizontal base includes a millimeter scale on both sides, marked in 1mm increments from 40mm to 180mm, with 0 corresponding to the center of the panning base. I know that my 600 f/4 lens needs the vertical arm locked at the 160mm mark and I no longer need to figure out that setting. The panning base has a 2.5° angular scale, measuring from 0 to 360° with an index mark on both sides. The tilt feature on the vertical arm also includes a 2.5° angular scale, measuring from 0 to 360° with an index mark on both sides. The base of the vertical arm is marked in 1mm increments on both sides, from -15mm to 15mm. The full gimbal's vertical rail includes a millimeter scale on both sides, marked in 1mm increments from 0mm to 146mm. All clamp options include a millimeter scale, marked in 1mm increments from -25mm to 25mm and the cradle's rail clamp includes index marks on both sides for vertical height adjustment. Three stainless steel flat head screws are used to mount a clamp or vertical rail to the vertical arm. The center is a 1/4"-20 x 3/4" and the other two are M5-0.8 x 12mm. When in a side-mount clamp, the screws are covered by a plate during use and they cannot fully back out. Properly-tightened, that is not a worry in the first place and any one of the three screws would handle a significant weight load. The PG-02, when assembled, is not small or light. 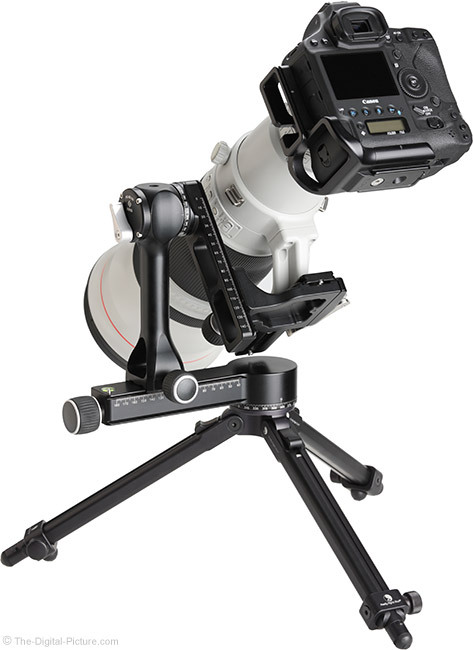 The B2-LLR-II 80mm clamp option weighs very slightly more than the B2-LR-II. For comparison, the Really Right Stuff BH-55 Ball Head weighs 30.52 oz (865.1 g). 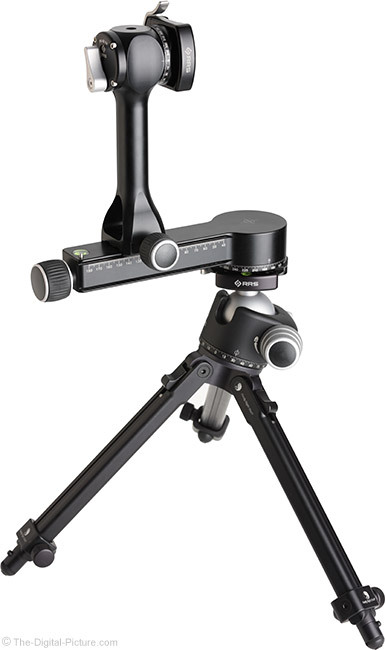 The PG-02 horizontal Base's tripod mount contact is 2.77" (70.4mm) in diameter and matches very nicely to RRS' 3-Series tripods such as the TVC-34. The horizontal base is the longest part, measuring 10.1" (26cm) in length with the panning lock knob tightened. The vertical arm measures 8.1" (20.6cm) in height with the clamp adding very slight additional height when rotated to its shortest dimension. The horizontal base adds another 1" (2.54cm) in height when mounted. The official specs say 9.6" (24.3 cm) for the total height. The PG-02 is rated to carry a 50 lb (23 kg) load. 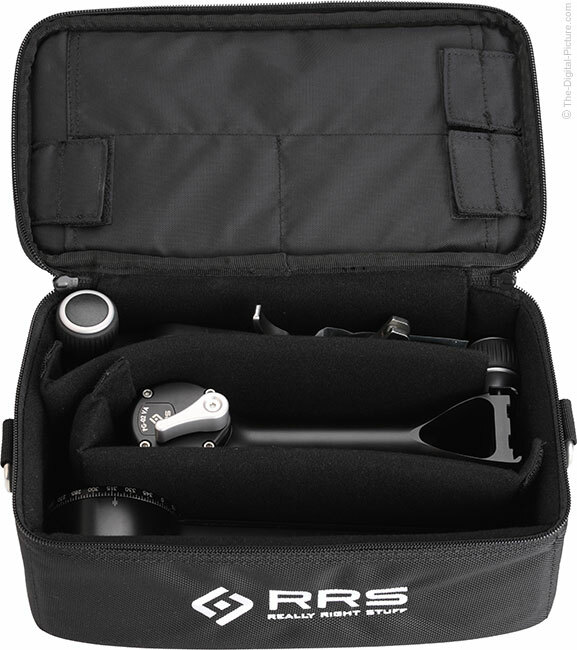 The RRS PG-02 requires a base for mounting and that base is usually a tripod or monopod. Weaknesses are additive in a camera support system, so choosing a good quality foundation is very important. As when using any head, the base must be at least as solid as the head to avoid becoming the minimum factor in terms of strength. If using a collared lens, adjustment of the lens in the collar will permit the camera to be leveled even if the head's base is not level, but to get the most out of the PG-02 or any other pano or gimbal head, the base must be level. Once the base is set up level, the camera will always be level. Taking away concerns such as that one allows the photographer to concentrate on capturing images. Of course, if a collared lens is being used, the collar must be locked tight with the camera level; otherwise, the camera will always be tilted. Tripod collars with click-stops at the 90° positions greatly aid in this task. 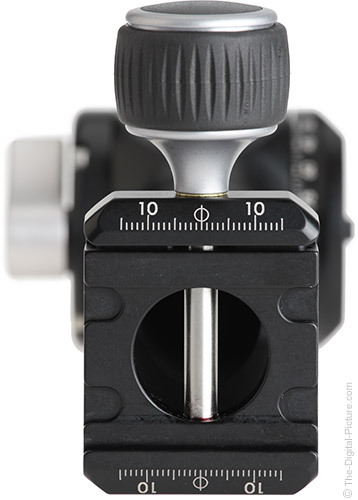 Simply leveling the tripod is adequate and typically this is the lightest, most-solid and lowest cost option. But, leveling a tripod can be a fiddly and somewhat time consuming task, making a leveling base an attractive option. Ideal for ease of use is to mount the PG-02 to a leveling base, either threaded directly onto the base or to a leveling base-mounted lever release clamp which works in conjunction with an optional dovetail adapter (RRS TH-DVTL-55 Dovetail Plate) mounted to the bottom of the PG-02 and other any heads in the kit, allowing all to be quickly swapped. The leveling base makes fast and easy work of the head leveling, though at the cost of some additional weight and, at least with many of RRS' leveling base options, reduction of the tripod's rated capacity. The Really Right Stuff TA-3 and TA-4 Leveling Bases are rated for 1/2 as much as the tripods they are designed for. 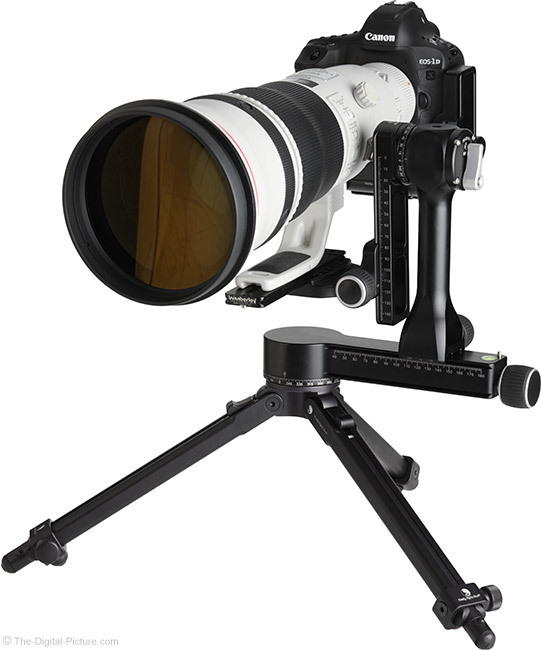 However, the TA-4 Leveling Base's load capacity rating of 50 lb (23 kg) makes it a perfect match for the PG-02, but of course, requires a series 4 tripod for use. If using a strong ball head such as the Really Right Stuff BH-55 Ball Head, the PG-02 with a Dovetail adapter can be directly attached to the ball head clamp and the ball head becomes the leveling base. Though not as low profile as a leveling base, the BH-55 is rated for twice as much weight as the TA-3 (50 lbs vs. 25 lbs). I was amazed to see vibrations settle similarly fast when using the BH-55 under the PG-02 as when direct-mounted to the tripod. Use the BH-55 as the regular ball head. When a pano opportunity shows up, mount the PG-02 right on the BH-55 and take advantage of that option. Having a selection of RRS parts is a bit like a pile of Legos. Once you get started, you just want to keep building. Partly because it is so fun, but primarily because what you build is so useful. I thought about creating a list of all of the options that could be attached to the PG-02's clamps or could be clamped to the PG-02's rails and ... I soon gave up as there seemed to be no end to the combinations. The versatility of the standard clamp and dovetail system combined with the amount of dovetail real estate on the PG-02 in conjunction with the threaded insert on top results in a practically unlimited set of uses. To get your thinking started, I quickly created this setup simply from the gear I was evaluating at the time. This Really Right Stuff Radical Rig is really ready for anything. Any part that has a dovetail can have something clamped to it. For example, here is the PG-02 with the horizontal base clamped into a BH-55 Ball Head. A great accessory for building on the PG-02 is the RRS MPR-CL II w/ integral clamp, typically used as a nodal slide to avoid parallax during pano capture and seen in many of the product images on this page. 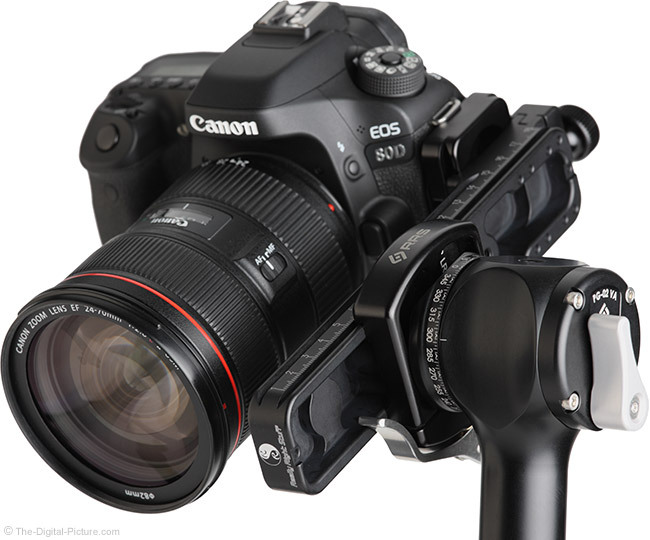 The camera mounts in the MPR-CL II's clamp and the MPR-CL II clamps into the PG-02's clamp. As mentioned earlier, this piece or similar is required for using non-collared lenses on the full gimbal cradle. 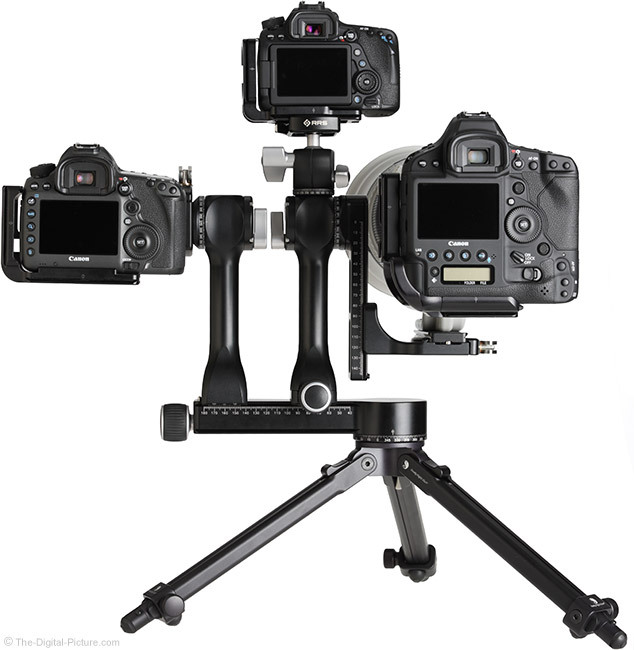 Note that for this camera and lens setup, the cradle should be raised to center the lens on the tilt axis. What tripod is that? 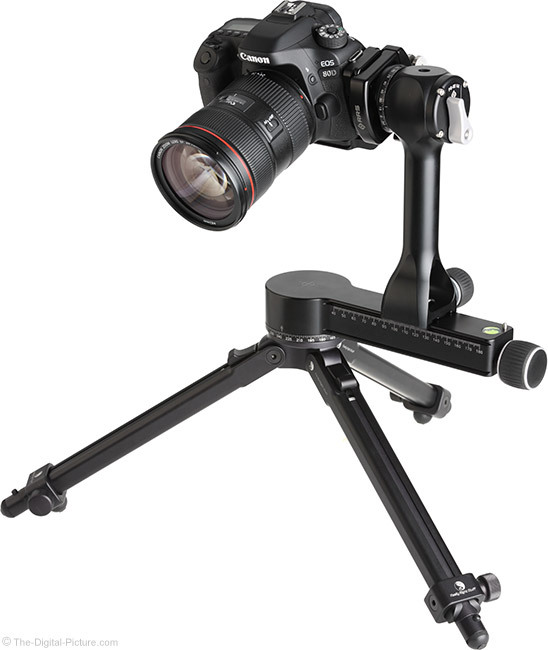 The tripod showing in many of the product images in this review is the awesome little Really Right Stuff TP-243 Ground-Level Tripod and the weight and bulk of the Radical Rig was not beginning to stress it. I was not nearly as sure about the shooting table the rig was sitting on. The PG-02 is simply a dream to use. All moving parts are extremely smooth. The knobs all feel and work great. It looks great. The panning and tilt axis lock knobs/levers are designed to enable practically any drag level desired. I mentioned the vertical arm's tilt lock knob was replaced by a lever. One benefit of that change is that only the thumb is needed to adjust the tilt tension, allowing the left hand to remain grasping the vertical arm. It is impressive how tightly the tilt rotation can be locked with a very short throw of the lever. The horizontal base is rather wide and that positions the panning lock somewhat far from the panning axis, but I haven't found any other annoyances. 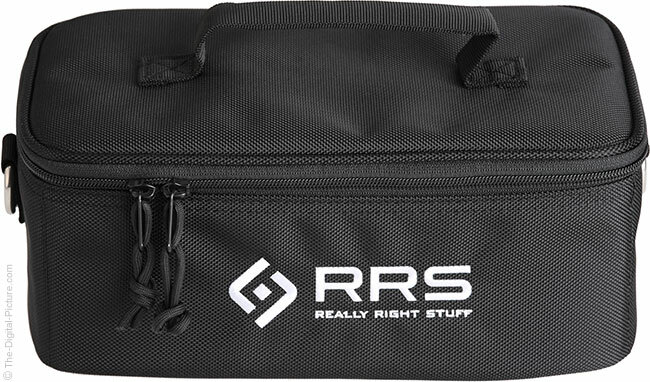 The RRS PG-02 out-of-the-box experience is a good one: open the RRS box and inside is a nicely padded, zippered nylon, RRS-logo'd carrying case with a handle on top and adjustable padded dividers inside. While the PG-02 is awkward to case while mounted on a tripod, its modular design breaks down nicely for storage and/or travel. This case will ensure they are well-protected. A convenient way to pack the horizontal base and vertical arm together is to clamp them together, ensuring that they do not impact each other (retaining their beauty) and eliminating one padded divider otherwise needed. Should I get the Really Right Stuff PG-02 Pano-Gimbal Head or the Wimberley WH-200 Gimbal Head II? The Wimberley WH-200 Gimbal Head II is a proven workhorse. It primarily does one thing, but that is an important thing (often the only thing needed) and it does that one thing extremely well. The Wimberley II has been in my kit since it was introduced well over a decade ago and this very smooth head still performs like new. Here are some comparison observations I can share. The Wimberley, despite the full gimbal cradle, dampens vibrations slightly faster (about 1 second less) than the side-mount RRS using the previously-referenced pro body and 600mm f/4 lens. The Wimberley is considerably less expensive than the side-mount PG-02 and far less expensive than the PG-02 full gimbal. The Wimberley's weight falls between the RRS options: 51.12 oz (1,449.3 g) compared to 44.32 oz (1,256.3g) for the side-mount PG-02 and 55.70 (1,579.1g) for the full gimbal. The RRS has a better handle and better holds a big lens locked tightly when carried (my Wimberley tends to slip slowly). The Wimberley is not as optimal as a pano head. The Wimberley and RRS heads are similar in height and width, though the Wimberley's cradle lock knob accounts for some of the width, making the Wimberley seem narrower. The Wimberley does not break down for storage and travel. Lacking dovetail rails, the Wimberley is not as expandable. The machined RRS parts and laser-etching look fancier. Both are very smooth in use. Wimberley also makes a side mount head that I have not yet used, the Wimberley WH-200-S Sidemount Head. This head should be more solid than the full gimbal, just as the RRS side mount is more solid than the RRS full gimbal. But, the Wimberley side mount head does not offer horizontal adjustment, meaning that it is designed for a narrow range of tripod ring heights. The Wimberley side mount is lighter than the RRS PG-02 side mount and, as expected, it is less expensive than even the Wimberley full gimbal head. Either can be justified. At least for now, I'm keeping both. One of my strengths is being able to visualize how a product will feel and work based on experience and from by studying images and specs. I'm not always right and my wife knows to ask if something exceeded or fell short of my expectations. I own and have used a lot of Really Right Stuff products and my love for them of course pushed my expectation bar very high for the RRS PG-02. I am happy to say that this product still managed to exceed even those already high expectations. The design and performance of the Really Right Stuff PG-02 Pano-Gimbal Head is really exceptional. This head looks awesome and it is equally great in use. You'll be looking for excuses to set it up.